PULLMAN, Wash. – Louisiana State University Professor Gail L. Cramer recently received the Washington State University Alumni Association (WSUAA) Alumni Achievement Award for outstanding contributions to agricultural policy, research and global agribusiness. Cramer is head of LSU’s Department of Agricultural Economics and Agribusiness. He has received a number of grants from the U.S. Department of Agriculture and other entities for research and has authored more than 220 scholarly articles, book chapters and volumes. In 2004, he received the Gamma Sigma Delta Distinguished Achievement in Agriculture International Award. In 2002, he was honored with the Sustainable Agriculture Education Association Lifetime Achievement Award. In 1989, he was appointed to the White House Agribusiness Commission. In 2007, Cramer, his wife and their son’s family established the Gail L. Cramer and Marilyn J. Karlenberg Cramer Endowed Scholarship at WSU. His community service includes the Kiwanis Club, Key Club and Babe Ruth Baseball. He earned a bachelor of science degree from WSU in 1963 and a master of science degree from Michigan State University the following year. He earned a doctorate from Oregon State University in 1968. His academic posts include visiting associate professor at Harvard University where he founded the International Agribusiness Management Association in 1992. He was named to his position at LSU in 2000. The Alumni Achievement Award is the highest honor bestowed by the WSUAA. 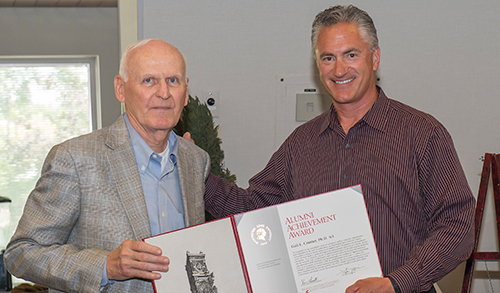 Since its establishment in 1970, fewer than 510 WSU alumni have received the award.